Lightweight and free-of-charge but without compromising efficiency, CodeLite carries a wxCrafter GUI Designer plugin for creating cross platform UI based on the wxWidgets toolkit. Developers can also utilize a Graphical Diff Utility to compare files and project versions. 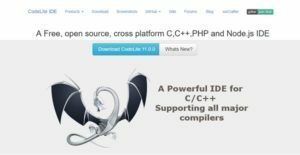 Developers can code more accurately and effectively with CodeLite’s generic support for compilers, with built-in support for GCC/clang/VC++. Errors are displayed as code annotations or as tooltip in the editor window, while errors can be clicked on a Build tab. The latest versions of CodeLite supports state-of-the-art debugger LLDB for OSX, Linux and Windows users. This compatibility ensures that produced work are at par with the newest technologies. Integrated GDB Support provides CodeLite users with a variety of tools to code more productively. A Watches table adds persistent watches with a single click, while a Quick Watch allows a variable to expand. A Locals tree automatically displays the current stack variables. Users can review a list of currently-running threads and switch between them using just a few clicks by using the program’s Threads view. Breakpoint management solutions and Memory View helps keep track of project versions. Refactoring functions include renaming of symbols and files. The application can also generate setters / getters and implement inherited pure-virtual and virtual functions. Users can easily change function signatures to match its header or implementation counterpart. Functions implementation can also be moved to another file. All these flexible features help developers code more conveniently. CodeLite users can create and debug applications with the program’s XDebug solution. An integrated SFTP allows workspace mirroring so that users can work remotely from virtually anywhere. CodeLite also has its own RAD (Rapid Application Development) tool for building wxWidgets-based applications. If you are considering CodeLite it could also be beneficial to check out other subcategories of Best IDE Software collected in our base of SaaS software reviews. Since each enterprise has particular business wants, it is sensible for them to abstain from searching for a one-size-fits-all ideal software solution. Needless to say, it would be futile to try to find such an app even among widely used software applications. The smart thing to do would be to list the various important factors that require consideration such as main features, finances, skill levels of staff members, company size etc. Then, you should do your groundwork thoroughly. Read some CodeLite reviews and investigate each of the other solutions in your shortlist in detail. Such in-depth research can ensure you weed out ill-fitting systems and select the app that presents all the aspects you require for business success. How Much Does CodeLite Cost? There are no enterprise pricing plans for CodeLite since the program is available for free. Users are simply presented with the option to voluntarily donate amounts ranging from $10-$250 USD in order to support continuous development. We realize that when you make a decision to buy IDE Software it’s important not only to see how experts evaluate it in their reviews, but also to find out if the real people and companies that buy it are actually satisfied with the product. That’s why we’ve created our behavior-based Customer Satisfaction Algorithm™ that gathers customer reviews, comments and CodeLite reviews across a wide range of social media sites. The data is then presented in an easy to digest form showing how many people had positive and negative experience with CodeLite. With that information at hand you should be equipped to make an informed buying decision that you won’t regret. What are CodeLite pricing details? What integrations are available for CodeLite? There is no information available about CodeLite’s specific third-party integrations. If you need more information about CodeLite or you simply have a question let us know what you need and we’ll forward your request directly to the vendor.